Whether you are selling a good or a service, developing a strong mobile strategy and design is critical to your success. Travel businesses – and more specifically hotels – are no exception. In this article, we explore how hotels can adapt to the mobile needs of the future, and the risks that they face if they don’t. According to the World Economic Forum, between 2016 and 2025, digitalization in the aviation, travel and tourism sectors will create up to $305 billion of value for the industry through increased profitability. In a recent report by eMarketer, it was also forecasted that digital travel sales will reach $189.6 in 2017 – with 40% of purchases to be made on mobile, versus 36% last year. Demonstrating the value of mastering digital – and the ever-growing importance of mobile. Unsurprisingly, China is leading the way. Mobile Booking Penetration (MBP) now stands at 59% and is expected to reach 77% by 2020. In stark contrast, MBP in the US is now only 22%, and it is expected to reach just 30% by 2020. As discussed in our recent whitepaper, ‘The road ahead in China’, China’s high MBP is driven by a combination of factors – the ‘mobile native’ nature of many Chinese individuals, having never owned a desktop and/or laptop; and the familiarity of Chinese consumers with mobile payment methods such as WeChat Wallet and Alipay has made them more comfortable with making large purchases on their phone. This is particularly important given China’s rise to dominate travel markets, with 37 million more passenger journeys in 2016 compared to 2015 according to IATA’s annual review. Similarly, Airbus forecasts that the outbound China market will double to over 200 million travellers per year by 2020. This not only signifies the importance of the Chinese traveller, but also enhances the need for travel businesses to take a mobile first approach. In addition to mobile being a high growth platform, mobile travellers are high value. For example, mobile travellers take more trips. Phocuswright’s recent research revealed that 56% of mobile travellers surveyed in the US had taken three or more trips in the last 12 months, compared with 34% for non-mobile travellers. Research from eMarketer also shows that mobile travellers are snapping up last minute deals. Despite the evident opportunity to grow sales and revenue by delivering an excellent mobile experience, research indicates that hotel suppliers have not yet mastered mobile. The opportunity cost being that other companies and channels will benefit from the chance that they are missing out on. 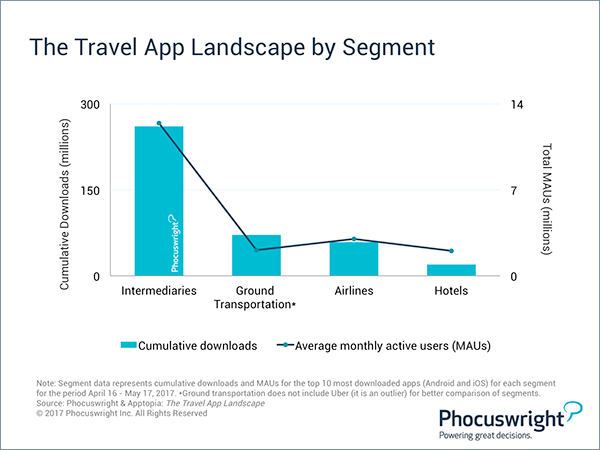 Phocuswright research in partnership with Apptopia reveals that intermediaries such as OTAs dominate the travel app landscape – meaning that they are benefiting where hotels are not. And the Airbnb app has more downloads and monthly active users than the top 10 hotel apps combined. With predictions from the World Economic Forum that $100 billion of value from within the travel industry will go from traditional players to new competitors, there is no room for complacency. Research highlights that the main issue for hotels is that they aren’t reaching user expectations. In part, this may be due to a lack of recent investment in hotels apps. 34% had not been updated since 2016, and 20% had not been updated since 2015 or earlier according to L2’s research. But perhaps it is also due to not knowing what they need to be delivering. It is clear from L2’s research that hotel apps need to up their game to stay relevant in the competitive space. Their key recommendations were to offer an app that does more than book a room, and to consolidate apps into one per brand. Most importantly, brands need to invest in their apps by keeping them up to date, and even advertising them. 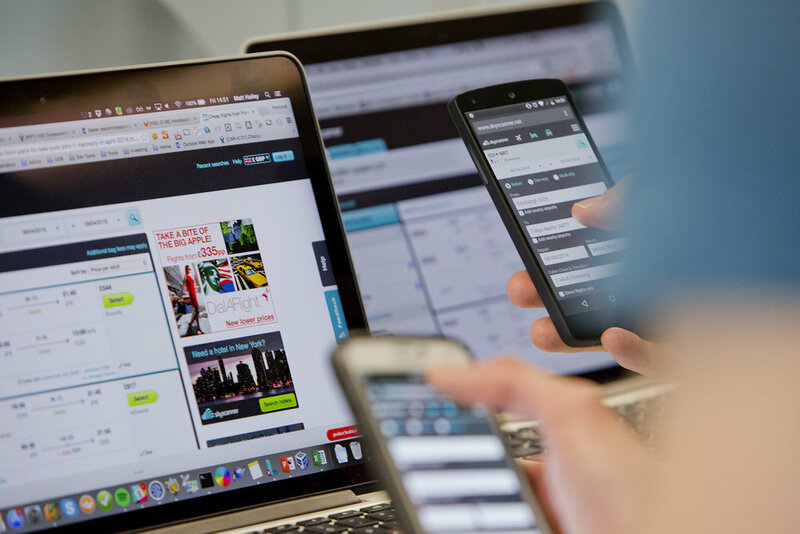 To give you a fresh perspective on how to approach mobile – and mobile design – we spoke with Skyscanner Senior Designer Chris Behr. How you would approach mobile and app design? I think that understanding what design is can be a very important part of understanding what you can expect from it. If you go in and assume that you can layer design on top of something that already exists for example, you will end up with poor results. Design really is a multidisciplinary task that is far more abstract than the screens that people see. You’ve got everything from research and systems design to the fine grained visual designs. And I think it’s for this reason that design needs to be considered an intrinsic part of a product. It’s not like you have something that is designed and something that isn’t designed. You simply have something that is designed by different people. So, if you were to design something for mobile, where would you begin? The way that we always start [at Skyscanner] is through research. Understanding the people who are using our product. The exact approach to this depends on what problem you’re trying to solve. If you take the example of discovering a problem in your product, where between steps C and D you are seeing a drop-off of 50% of your users. You have captured this using quantitative data, but it only identifies a numerical drop. It doesn’t give you the reasons why it’s happening, or help you to know anything about the people that are dropping off. So, you may do user testing to try and look at what actions people are performing, but it won’t always help you to identify and overcome the user problem being faced. In some cases, the problem is much bigger than a single drop off point – it may not be something just confined to that part of the app. You need to find ways to go out and understand the root cause of the problem. What would you say is the difference between mobile design and web design? I don’t know that there is a difference per-se. Mobile design, native design, is something that is targeted to a different kind of user. You probably want to concentrate on people that have taken the time to download your app. People who are viewing your brand as a conscious choice will probably engage with it more. This has particularly strong implications if you are dealing with content, because placing long form content into apps tends to work better versus short form content in web. Although this isn’t consistent across everything. As well as the audience, you also must consider the technological capabilities. You unlock a lot more horsepower to be able to do animations in apps for example. But ultimately, you are still trying to solve somebody’s problem. You’re still trying to create a solution which helps somebody to do something, so you have to design with the same kind of solutions in mind. How would you approach localisation, and think about mobile design differently across different markets? Again, it is a case of looking at how people in each market use their devices, and the ecosystem that exists around them. I think China is a pretty good example because of the way that payments work. Our payment systems are a lot more centralized around banks, whereas in China to pay using your phone is a much more natural thing. So, understanding what parts of a market are unique, and how they affect the things that you are trying to do is really the key. Again, it is probably a catch all answer, but using user research to understand the people who will be using your mobile site or app is vital: what do they do? What do they expect? What are they trying to use your product for? Understanding user expectations is a big part of this. You may launch something in one market that does all these far-reaching things, and then when you launch it in another market where it is underpowered by comparison you may need to rethink things. There will also be specific cases where culture impacts design expectations. In Japan for example, we have found that individuals want to be very secure in the decisions that they’re making, so providing a lot of information is vital. On the other hand, in ‘western’ countries we tend to prefer lots of open space, quite clean design. What do you need to do to engage users with your mobile experience, and make that experience positive? Firstly, it is best not to assume that the user will always be in your app. This means that it is important to integrate with other platforms, such as Whatsapp or Facebook Messenger, and how you can use notifications in the right way. Everything you create must cooperate with everything around it. Secondly, you need to be providing people with the right information at the right time, and make things as easy for people as possible. And sometimes this means doing something as simple as conforming to platform standards; so not trying to reinvent the wheel and making something that looks like iOS on Android. It is easy to end up over-complicating experiences, and ending up with a product that is very confusing and jarring for people. And this prevents them from being able to quickly learn and understand your interface. And what about trust? Booking a Hotel can be a big investment, so what can be done to create trust in your mobile experience? As mentioned, ease of use is key. Having something which doesn’t function in the way that somebody expects it to can shut down any element of trust very quickly. It is also important to have strong error states so that users are guided through a problem and not just abandoned with generic error messages if something goes wrong. And it is fair to assume that something will go wrong, eventually. You only have to get things wrong once to really betray a user’s trust – and you see it all the time. When you consider the amount of marketing effort and spend that goes into getting somebody on site, or to install an application, then getting error states wrong not only wastes the users time but all the spend up until that point as well! How does the on-boarding experience play into this? How can you make sure not to lose your hard-earned users from the very beginning? Rally you are always better subscribing to the notion of show don’t tell. Everybody has a limited memory, so it is always better to expose features slowly rather than bombarding your users with ten screens showing them all the things that they should do. This is particularly important when it comes to permission priming, such as asking for permission to access photos on a user’s device. You shouldn’t ask for all permissions in one go. You need to ask when the user will have context, and understand the benefits. Finally, when considering mobile design, how would you similar or dissimilar would you make it from web – with brand implications in mind? I’m going to borrow a phrase that Steve [Skyscanner Senior Design Director] introduced us to. It’s one that I absolutely love as a way of understanding how you should approach visual design and brand within a stable of products. It’s the idea that you’re not aiming for consistency, you’re aiming for coherency. It’s like we talked about with platforms. You shouldn’t just cookie cutter your visual style across all platforms, because then all that happens is you end up with this really homogenized designing for the minimum level. You try to create a coherent visual style, and then you apply that platform standards to leverage what works for each one. So, your app and your website, or every touchpoint, should feel like they’re part of the same stable. When it comes to voice for example, if your brand is purely based on visual elements, how do you get your brand into a conversational application? How do you get brand into something which doesn’t even have any touchpoints? Something Internet-of-Thingsish for example. Brand should always be a thing which has an element of tangibility, but isn’t reliant on just one visual element. It should incorporate tone of voice, and auditory elements potentially. So yes, trying to establish that consistency doesn’t just mean you should apply each screen in every place. But you should instantly know that it’s that brand. Hotel suppliers are at risk of losing out on revenue as travellers continue to become increasingly mobile, and they fail to update their mobile strategy and/or applications. And their inability to earn a place on user devices leaves them fighting an increasingly difficult battle for the traveller – with disruptive forces such as Airbnb taking their place. The only solution is innovation; based on research and a genuine investment in strategy and design for the future.